Allergies are abnormally sensitive reactions to usually harmless sub-stances in the air people breathe, the things they touch, or the foods they eat. The human body is filled with special cells and organs that stand ready to fight invaders. Together they are called the immune system. One line of defense in the immune system is a protein called an antibody. These antibodies are like the hall monitors of the bloodstream, constantly looking around for troublemakers. When they spot a troublemaker, the antibody grabs it to make sure it does not cause problems and then removes it. Antibodies are an important way the body fights infections, colds, viruses, and diseases. Antibodies roam through the bloodstream and look for foreign substances that are not supposed to be there. Foreign substances in the body are called antigens. Usually, antigens are things we want removed, like a virus. Sometimes, however, the antibodies attack a usually harmless substance that in most people would not cause the immune system to swing into action. There are hundreds of substances in the air people breathe, the food they eat, and the things they touch that may cause this reaction. When it occurs, people are said to have allergies. It is a disorder than affects more than 50 million Americans. When Latrell plays outside during some months of the year, he sneezes and his throat feels itchy. When Melinda visits an apartment where there is a cat, she finds her eyes start to water. When Mrs. Gonzalez feeds her baby formula with a milk product, the baby cries and seems to have a stomach ache. And when Bobby touches anything with metals like chrome, his skin develops hives. All of these are examples of allergic reactions. Most people can play outside, pet animals, drink milk, and touch metals without any problems. But for millions of people with allergies, these things and hundreds more can cause their bodies' immune systems to jump into action. Their reactions can be as mild as a stuffy nose or as severe as death. Things that are inhaled, such as pollen, dust, mold spores, and pet dander * . Things that are eaten, such as milk and items made with milk; eggs; shellfish like shrimp; and peanuts and other nuts. Things that are injected, such as penicillin and some other medications, or the venom from an insect sting. Things that are touched, such as nickel in costume jewelry, dyes in nail polish and shampoos, and latex * . * pet dander refers to microscopic parts of the pet's skin that flake off and get into the air people breathe. * latex (LAY-tex) is a substance made from a rubber tree and is used in such things as medical equipment (especially gloves), toys, and other household products. The first time the body's immune system is confronted with a foreign substance like a virus, it remembers the substance. This allows the body's immune system to disarm the foreign substance with antibodies the next time it is encountered. The body can produce millions of different antibodies. Their job is to capture the foreign substance by binding onto it, like two puzzle pieces fitting together. These antibodies are also called immunoglobulins (im-mune-o-GLOB-u-linz). An antibody known as immunoglobulin gamma E (IgE) causes allergic reactions by attacking substances that are foreign, but which usually are harmless to most people, like pollen, food, and metals. When IgE attacks, it causes special cells known as mast cells to release chemicals that irritate people with allergies. Mast cells are found in large quantities in places like the nose, eyes, lungs, stomach, and intestines. As mast cells release irritating chemicals, the tissues swell and produce the other symptoms of inflammation and allergies. But why do everyday substances like food cause allergic reactions in some people and not others? Scientists believe the tendency may be something inherited from parents. Other possible reasons range from lifestyle to changes in the environment. What Kinds of Allergies Do People Have? Many people have more than one thing that causes their allergies. The most common allergy is allergic rhinitis (ry-NITE-is), which is commonly known as hay fever. It affects about 35 million people in the United States, many of whom are allergic to pollen and mold spores from plants and trees. Allergic rhinitis causes a runny nose, sneezing, and itchy nose and throat. Another common problem is skin allergy, whose medical name is allergic dermatitis. Hundreds of substances in metals, cosmetics, shampoos, some medications, and other chemicals can cause an allergic reaction when some people come into contact with them. It causes the skin to itch and develop a rash. About 10 percent of children have allergic dermatitis. Recently, there has been a lot of interest in allergic reactions to natural latex rubber, which is used in many medical devices, toys, and other things around the house. 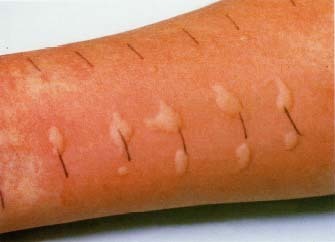 A latex allergy can cause symptoms like allergic dermatitis, but it also can cause anaphylaxis, the most dangerous allergic reaction, which can cause death unless people are treated quickly. In the 1960s, about 3 percent of American children had allergic dermatitis, or allergic reactions to things they touched. By the late 1990s, that number had increased to 10 percent. The numbers are similar or even higherfor asthma and other allergic disorders. Why the increase? The American Academy of Allergy, Asthma and Immunology suggests several reasons, ranging from differences in how bodies are functioning, to changes in lifestyle and the environment, to better reporting and diagnoses of allergies. People are living in houses and working in offices that are better insulated than in the past, and they are spending more time in them. This puts them in contact more often with dust mites and other pollutants that cause allergies. Poverty also appears to be a factor. Increasing numbers of poor people have asthma, and often cannot get the medical care they need. Insect stings can trigger an allergic reaction, including anaphylaxis. The stings can cause minor reactions in most people, like pain, swelling, and itching around the sting. But for some, the sting causes an allergic reaction throughout the body. Reactions to certain specific foods also are common. When some people eat foods like eggs, milk, shellfish, or peanuts, they experience an allergic reaction. It can manifest as itching in the mouth and throat, hives, stomach cramps, nausea, vomiting, or diarrhea. Certain foods as well as allergens that are inhaled also contribute to asthma, a chronic lung disease that affects up to 17 million Americans. The symptoms of allergies are varied and similar to the symptoms of other disorders. For example, a runny nose could signal allergic rhinitis, a cold, or influenza. Diarrhea could mean a food allergy or food poisoning from bacteria in contaminated food. This can make it difficult for doctors to diagnose allergies. The first thing doctors usually do is take the medical history of both the person with the possible allergy and the history of family members. Doctors are looking for the situations where the allergic reactions occur and whether other family members have a history of allergies, since they tend to run in families. They also want to rule out other possible causes of the reaction. Doctors may use an allergy skin test. This involves placing a small amount of various substances on the skin to see if any of them cause an allergic reaction. Or the doctors may test the blood for the presence of IgE, the antibody that exists in higher levels in people with allergies than in people without them. If doctors suspect the allergy is to a particular food or material (like dairy products or latex), they usually try to have patients avoid them and see if the symptoms get better. Once doctors determine that patients have an allergy, the first line of defense is avoiding the substance as much as possible. In some cases, that can be relatively easy, such as if people are allergic to a particular food, like nuts, milk, or shrimp, or to a substance, like nickel or chrome. Allergies to pet dander can be limited by not having animals in the home and by avoiding them in other places. Anaphylaxis is the most dangerous allergic reaction, and it can cause death unless people are treated quickly. Unlike other allergic reactions that usually affect just the nose, skin, or stomach, anaphylaxis affects many parts of the body. Anaphylactic shock is a medical emergency: the throat and airways to the lungs may swell, causing trouble with breathing. Blood pressure maydrop, and people may feel nauseated and have diarrhea and stomach cramps. Without immediate medical treatment, people with anaphylactic shock may lose consciousness and die. Insect stings, with as many people as 5 percent of the population at risk of anaphylaxis from stings from bees, wasps, or fire ants. About 40 deaths a year result from such stings in the U.S.
Foods, especially peanuts, shellfish, and some food additives. The best prevention is avoiding situations and substances that can cause the reaction. The most common treatment is epinephrine (ep-i-NEF-rin), also known as adrenaline. People who have had anaph-ylactic shock often carry epinephrine, which can be injected with a needle. * dust mites are tiny insects that live in dust and in materials like carpets, pillows, mattresses and furniture. It gets more difficult to avoid substances like pollen, mold spores, and dust mites * . But even these things can be avoided to some extent. For example, people can stay indoors more or close their windows during times when pollen and mold spores are high in their areas. And dust mites can be controlled by removing rugs, or by vacuuming rugs often, by covering pillows and mattresses with protective material, by washing sheets regularly in hot water, and by using special filters on heaters and air conditioners. Doctors sometimes use skin tests to diagnose allergies. The reactions shown here demonstrate allergic response. 1998 SIU, Biomed Comm/Custom Medical Stock Photo. There are many over-the-counter and prescription medications for allergy. Some people take them only when symptoms occur. Others use them daily to prevent allergy symptoms or at least to make them less severe. Histamine is one of the chemicals released in mast cells when people have allergic reactions. Antihistamine medications help neutralize the chemical. Often anti-histamines are taken with a decongestant, which helps open nasal passages. Some antihistamines cause drowsiness, although newer versions do not cause as much sleepiness as older ones. Another alternative for people with allergic rhinitis are sprays that are used in the nose. Some of these help reduce swelling in the nose, and others work to prevent mast cells from releasing their chemicals. Some of these are available without a prescription and others require a prescription. For some patients, doctors suggest immunotherapy, which commonly involves allergy shots. By injecting a small amount of an allergen into patients, immunotherapy aims to help the body become less sensitive by regularly exposing it to the substances that cause the allergic reaction. Immunotherapy is used for people who are allergic to substances like pollen, dust mites, and animal dander, but not for people allergic to foods. The shots are given as often as several times a week at first and then reduced to about once a month for three to five years afterward. Medic Alert tags and bracelets are useful for people with drug allergies. Wearing the tag or bracelet can alert medical personnel to the allergy in the event of an accident or loss of consciousness. Some companies offer medical alert tags that have an identification number that is unique forthe individual. In the event of an accident, a doctor anywhere could retrieve the patient's medical history. Some schools have discussed the need for a "peanut-free" zone, which would be an area where no peanut or peanut products could be served or eaten. It sounds odd, but the schools are reacting to increasing reports of a dangerous allergy to a lunch-room staple, peanut butter, as well as to other foods made with peanuts. Peanuts and other nuts are among the most common foods that cause allergic reactions, and the reaction can be particularly dangerous if it causes anaphylaxis. Experts estimate that more people die each yearfrom allergic reactions to peanuts than from bee stings. People with peanut allergy can react to very small amounts; some may react just from smelling peanuts. Because such small amounts of peanuts can trigger an allergic reaction, some schools have removed peanut butter and similar foods from their menus. As children grow, they sometimes find that their allergies get better. Until then, it is important to avoid things that cause allergic reactions and, for food allergies, always to read food labels carefully. Food manufacturers sometimes change ingredients, so even familiar foods and familiar brand names may not remain peanut free. Allergies can be anything from an annoyance to a life-threatening illness. Most people, however, can find ways to live with their allergies by avoiding those things that cause them, and by seeking treatment when necessary. The American Lung Association Asthma Advisory Group, with Norman H. Edelman, M.D. Family Guide to Asthma and Allergies: How You and Your Children Can Breathe Easier. Boston: Little Brown, 1998. Pressman, Alan, Herbert D. Goodman, and Rachelle Bernadette Nones. Treating Asthma, Allergies and Food Sensitivities (Physicians' Guide to Healing). New York: Berkley, 1997. U.S. National Institute of Allergy and Infectious Diseases, Office of Communications and Public Liaison, Building 31, Room 7A-50, 31 Center Drive MSC 2520, Bethesda, MD 20892-2520.